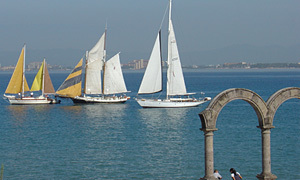 The Best Day of Your Puerto Vallarta Vacation! • Click HERE for more info about Pegaso Whale Watching Tours. If you want to experience the best sightseeing tour that Puerto Vallarta has to offer, and explore all of the natural wonders in and around Banderas Bay, but don't want to take a "Booze Cruise," then a Pegaso Sailing Charter is perfect for you! Whether you are into sailing, snorkeling, fishing, beach combing, whale watching, or you just want to spend a lazy day relaxing in the breeze and sunbathing while enjoying great music, tasty food and excellent scenery, climb aboard one of Pegaso's sailboats for "The Best Day of your Puerto Vallarta Vacation!" Operated by Bill Knight, Pegaso Chartering started offering kid friendly Puerto Vallarta sailing tours in 1994 with the goal of providing visitors of all ages an opportunity to see the incredible beauty of Banderas Bay and experience the wonderful culture of Mexico aboard one of his traditional sailing vessels. Pegaso Charter's fleet of sailing yachts feature every comfort and convenience, with plenty of room on deck for lounging in the sun or shade, and their experienced bilingual crew's goal is to provide you with exceptional service to ensure a thoroughly relaxing experience in a safe and comfortable environment. Whether you choose a full day snorkeling and sailing tour to Yelapa or Las Marietas Islands, a half-day snorkeling trip to Los Arcos, sunset sailing, a whale watching trip, or a private sailboat charter, the romance and adventure of the high seas can be yours, at least for one day, with Pegaso Chartering in Puerto Vallarta, Mexico. Climb aboard our comfortable sailboats where you are treated to the exceptional service that is the trademark of Pegaso Chartering. Pegaso Chartering trips feature an excellent combination of whale watching and sailing onboard traditional sailing vessels. A Day of Whale Watching - and What a Day it Was! On this, my second trip to Puerto Vallarta; I now understand what all the fuss is about. I've always had a love for water, but my whale watching experience aboard the Tinuviel, one of the Pegaso Charters sailboats, is something I will never forget. 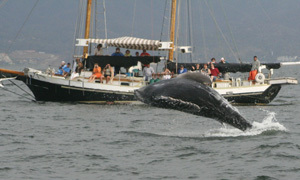 The official 2008/2009 Puerto Vallarta Whale Watching Season opened on December 8, 2008 and continues through March 23, 2009. Pegaso Chartering offers tips for enjoying fun and responsible whale watching in the Bay of Banderas. Wanna Have Some REAL Fun in Vallarta? Sometimes when you want to go have some fun and you really want it all, it's hard to find. Know the feeling? Well, I am here to tell you that it is possible to spend a completely fun-filled day on Pegaso Charters' Las Animas Adventure Park tour.